Syfy and Spotify have announced a new digital and on-air partnership for the network’s upcoming new series, the science fiction thriller, Hunters. From producers Gale Anne Hurd (The Walking Dead) and Natalie Chaidez (Syfy’s 12 Monkeys), the series will feature a unique Spotify in –show integration throughout the 13 part season. 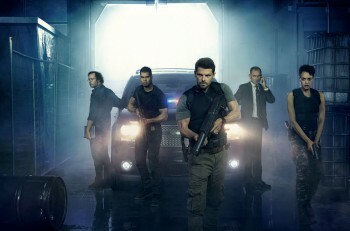 Hunters will premier on Syfy on Monday, April 11 at 10 PM ET/PT. Spotify will extend the series online, hosting a Hunters’ themed experience throughout the series run. Spotify will play a unique and vital role in the series plotline. In a “gritty, underground world, the “Hunters” are ruthless, otherworldly terrorists. They communicate via coded messages within Spotifly playlists. The series multimedia storytelling will feature songs by both classic and current artists, such as Savages and the Kinks, as well as cover tracks exclusively on Spotify. Online the partnership will include a season long digital experience called “Crack the Code,” where fans can enter sweepstakes by deciphering a secret coded phrase hidden within special playlists on Spotify (laced with tracks featured in Hunters). Things kick off on Thursday, March 17, with Syfy offering an innovative experience at The Spotify House in Texas at SXSW. Attendees will enter a custom-built environment within the house, employing a branded tablet equipped with headphones and an “augmented reality” (AR) app. Participants can immerse themselves in the world of the show, and experience firsthand what the life of a Hunter is like. While listening to custom music from the show, the participants will use the AR app to view sound waves throughout the space that will pulsate with the music, mimicking how the Hunters see and communicate though sound. The AR app will also be equipped with facial tracking technologies which will transform attendees into Hunters through photos. Socially, guests can share their experiences by creating videos of the transformed environment and augmented faces. In the 13-part HUNTERS, when Baltimore FBI agent Flynn Carroll’s (Nathan Phillips, “Wolf Creek”) wife goes missing, his search leads him to a highly-classified government organization – the Exo-Terrorism Unit (ETU) – who track and fight alien terrorists. Britne Oldford (“American Horror Story”) plays Regan, a valuable ETU operative keeping secrets of her own. The series also stars Julian McMahon (“Nip/Tuck”) as the dangerously unhinged terrorist, McCarthy. HUNTERS is from executive producers Gale Anne Hurd (“The Walking Dead,” “The Terminator Trilogy”) and Natalie Chaidez (“12 Monkeys,” “Heroes”), who also serves as showrunner, and Emile Levisetti (“Royal Pains”). The series is inspired by best-selling author Whitley Strieber’s novel, Alien Hunter. HUNTERS is from Universal Cable Productions. Spotify is an award-winning digital music service that gives you on-demand access to over 30 million tracks. Our dream is to make the entire world’s music available instantly to everyone, wherever and whenever you want it. Spotify makes it easier than ever to discover, manage and share music with your friends, while making sure that artists get a fair deal. Production for Syfy series “Hunters” has begun!